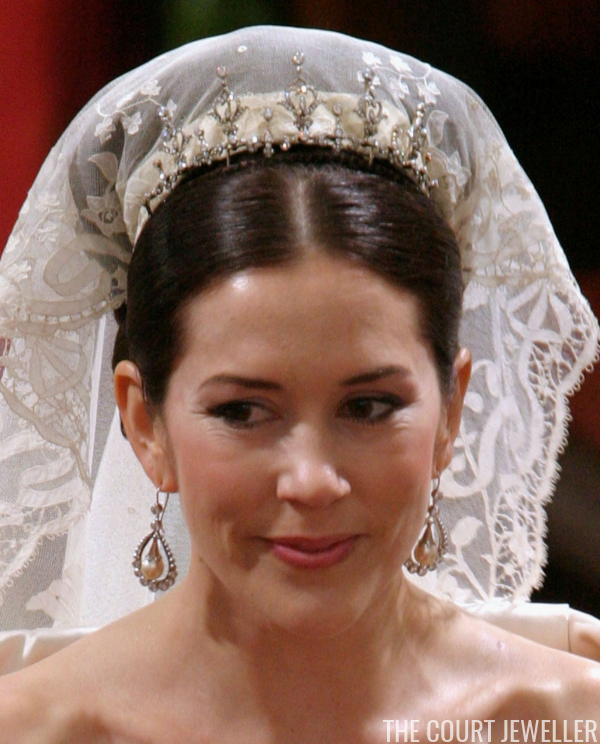 Unlike many royal brides, Crown Princess Mary of Denmark's tiara debut wasn't on her wedding day. 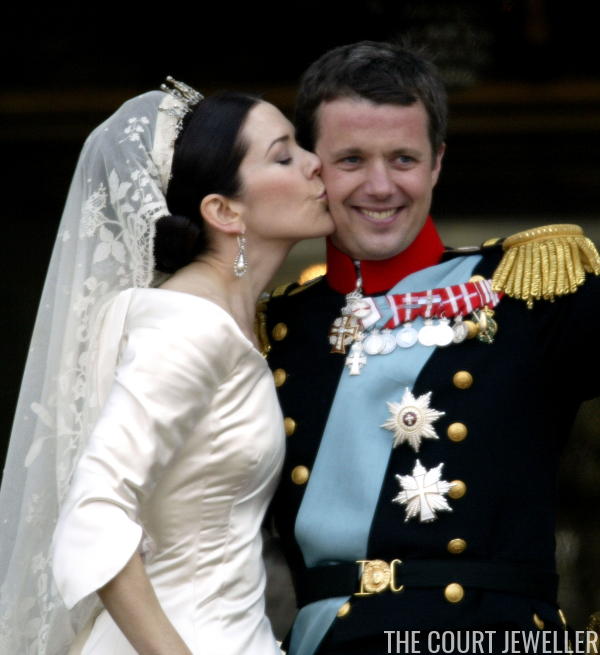 She'd already worn a grand tiara -- the diadem from the Danish Ruby Parure -- during her pre-wedding celebrations. Even so, she did wear a brand-new (to her) sparkler on her wedding day: a romantic, convertible diamond tiara. Mary’s wedding tiara, with its diamond heart and fleur-de-lis motifs, was a gift from her new parents-in-law, Queen Margrethe II and Prince Henrik of Denmark. Unlike the floral tiara that Princess Marie wears, this was a gift, not a loan, which means that the tiara is Mary’s personal property. No information on the piece’s provenance has been released, so unfortunately we don’t know how Margrethe and Henrik acquired it (although some believe they may have bought it at auction). We also don’t know when or by whom it was made. We do know the provenance of the lace veil that Mary wore with the tiara, however. Her new mother-in-law loaned her one of the family's most precious pieces: the Irish lace veil that was first worn by Princess Margaret of Connaught on her wedding day in 1905. If you're a regular reader here, you know all about Margaret's tragic story: she became Sweden's crown princess, had a happy marriage and five children, and then died young. The veil was used to cover Margaret's body in her coffin, and then it was given to her only daughter, Ingrid, who later became Queen of Denmark. Ingrid wore the veil at her wedding in 1935, and since then, each one of her female descendants has also worn it as a bridal veil. Margarethe's decision to lend the veil to Mary speaks, I think, of her respect for Mary, who will one day be Denmark's queen consort, just as Ingrid was. Anyway -- back to the tiara. We also know details about a significant modification that the tiara has received in recent years. In 2011, Danish jeweler Marianne Dulong added a row of pearls to the base of the tiara, plus larger pearls atop each of the tiara’s shorter elements. The modification is not permanent; Mary still wears the tiara both with and without the pearls. But the piece is even more versatile than that: it can also be taken off its frame and worn as a necklace. I'm almost inclined to think that it's even more beautiful in necklace form. I've seen many comments noting that the tiara was not really grand enough for a future queen -- or that it got lost a bit in the veil on the wedding day -- but I think that the pearls help to add more substance to the design. And as with Crown Princess Mette-Marit of Norway’s wedding tiara, I would not be surprised if this tiara is eventually worn by one or both of Mary’s daughters as a “first” tiara — its small profile would be perfect for a young princess.